Masóweczka pierwsza klasa, zjadłem 6 opakowań i tyle samo na wadze poszło. I portion (2,5 scoop) 1,5 hours before training, II portion up to 0,5 hour after training, the remaining doses between meals. I portion (2,5 scoop) in the morning after waking up, the remaining portions between meals. Protein-carbohydrate supplements should be dosed according to the individual needs for energy and building elements. A person who cares about increasing muscle mass should provide the organism with more energy and protein and sometimes it is hard to cover the whole demand only with diet. The best time for carbohydrate-protein supplements is the period of prolonged fast between meals and after training. Universal creatine stack. 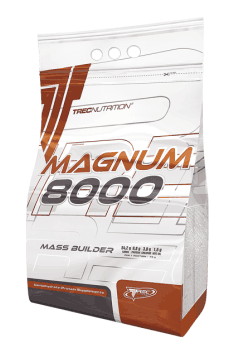 It increases strength and muscle mass, improves concentration, accelerates anabolism. The combination of beta-alanine and creatine for maximal effects. Five forms of creatine were used. Pre-workout supplement for professional athletes. It works anabolic and improves muscle hardness. Whey proteins (proteins from micro-filtration of cow's milk) are approx. 20% of milk protein. They are characterized by a biologically active ingredients, particularly exogenous amino acids (BCAA and lysine and EAA), also beta-lactoglobulin (36%), alpha-lactalbumin (20%), immunoglobulin (10%). They store retinol and iron in cells, stimulate the level of the bacterial flora. The use of whey protein supplements is recommended in almost all sports, mainly representatives of power sports and bodybuilders as a dietary supplement of high quality protein, especially pre- and post-workout. Available in the form of pure concentrates, hydrolysates and isolates as well as a component of nutrients (protein bars, carbohydrate-protein meal type MRP). Dosage: according to individual needs, typically 30-90 grams per day. Milk protein (protein) is a combination of casein protein (approx. 80%) and whey protein (approx. 20%), derived from cow's milk by micro filtration. They are characterized by a high nutritional value because it contains more BCAA and lysine from the reference FAO protein, however, they are more digestible. Used quite often in the sports diet of due to lower prices in relation to supplements based on WPI, WPC, micellar casein and calcium caseinate. Concentrates and isolates of milk proteins are components of carbohydrate-protein and high-protein supplements and as well as of meal substitutes (MRP). Dosage: according to individual needs for protein, usually from 30-90 grams per day.